A truly iconic site for dating in Chicago! For all of its well-deserved reputation as a great food town, a legendary sports city, and one of the birthplaces of the Blues, the city of Chicago is underrated as a town for lovers. Yet, for savvy couples who don’t like to follow the bar scenes, Chicago dating opportunities abound in many romantic gems throughout the city. First dates are exciting, because they can be the start of a new adventure. Avoid the “same old same old” by daring to be different. Here are some first-date ideas for different times of the year in Chicago. In spring, this 35-acre Chicago landmark is a great casual destination for a daytime first date. Lincoln Park Zoo is one of the oldest zoos in the United States and home to more than 1000 animals representing over 200 species. Best of all for daters on a budget – it’s free. TIP: Indulge your playful side with a ride on the Endangered Species Carousel and finish off with a picnic by the almost-200 year old iconic Burr Oak tree that is older than the city. 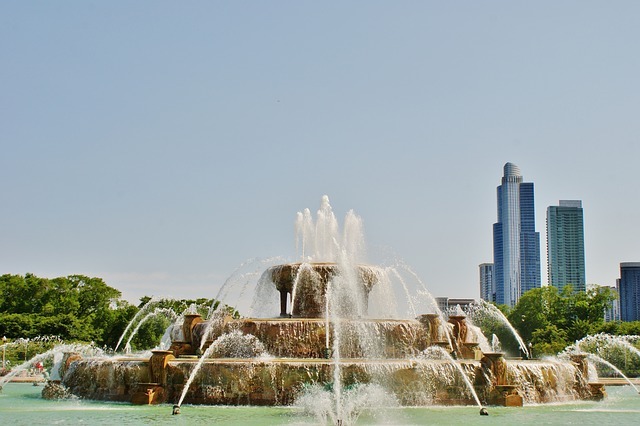 Located in Grant Park, this nearly-100 year-old fountain is among the largest in the world. Opening in April, the Fountain boasts spectacular 20-minute water shows begin every hour, making it an ideal Chicago dating destination perfect for spur-of-the-moment picnics or arm in arm strolls. At night, the displays pulse to choreographed music and lights. TIP: Look carefully, and you’ll notice that the fountain was created in a Late Baroque “wedding-cake” style, drawing inspiration from the Latona Fountain in the Garden at the Château de Versailles. Entering its fourth year, Shakespeare in the Parks is a new favorite summer tradition in Chicago. Dating can be so much more imaginative than the tired old routine of dinner-and-a-movie, so why not experience the Bard’s classic works together out-of-doors in one of 18 neighborhood parks? After all, it’s free. TIP: 2015’s unique offering is Shakespeare’s Greatest Hits, a unique and fresh take that mashes-up scenes from the playwright’s most famous works, including Macbeth, Romeo and Juliet, and others. With its roots steeped in the tradition of early twentieth-century Delta Blues, Chicago blues evolved into a separate musical genre that eventually helped give birth to modern American rock music. Show your appreciation for local culture and show your date why Chicago is known as the “Blues Capital of the World”. TIP: Held every June, the Chicago blues Festival is the world’s largest free blues music festival, attracting more than half a million fans a year. Here’s a secret tip for first dates – feed the person you’re with if you want a second date. If your idea of Chicago dating doesn’t include pretentiousness, why not treat your date – and yourself – to one of the city’s most iconic signature dishes? We’re talking authentic deep-dish pizza, paisan! And if you’re going to go that far, why not go to the place that started it all, way back in 1943 – Pizzeria Uno. When the idea caught on, the owners opened Pizzeria Due – a whole block away. TIP: Order early and bring your best first-date conversation, because the pizza takes at least 45 minutes to cook. This one’s a bit different, because it requires a short drive, so save it for that extra-special first date. But, if you make the effort, you won’t be disappointed, because from mid-September through Halloween, Sonny Acres Farm offers a cornucopia of fall-themed activities – everything from roasted corn to cotton candy to haunted houses to the obligatory romantic hayride. Pick and paint the perfect pumpkin with your partner. TIP: Every year, the farm sells up to 400 tons of pumpkins to visitors. Make the date special by picking a pumpkin or two together, to purchase and take home. Sure, you’ve lived here all of your life, but when is the last time you actually went to one of the world-class museums or exhibits in Chicago? Dating couldn’t be easier with a trip to one of these cultural landmarks, because interesting conversation is built right in. TIP: Museum Campus, located in the southeast corner of Grant Park, is home to three of Chicago’s premier museums – the Field Museum of Natural History, the Shedd Aquarium, and the Adler Planetarium – perfect for an out-of-this-world first date experience. When it comes to winter dating in Chicago, does it get any more “Chicago” than outdoor ice-skating? After a few exhilarating laps with the Chicago skyline in the background, warm-up together with hot chocolate and each other’s company. TIP: If you love the park, you don’t have to wait for winter – during the warmer months, the rink converts to a walking path. Don’t worry, you can still get your blood pumping on one of the rock-climbing walls. No matter what the tastes and interests of you and your date are, there is something for everyone in Chicago. Dating is supposed to be about fun, excitement and discovering the other person. With a little imagination and a taste for adventure, you can easily create a first date that just might create a lifetime of memories.